Holidaymakers in the seaside town of Weston-supe-Mare today awoke to find the cataclysmic results of a misunderstanding during the planning of celebratory events to mark the re-opening of Weston-supe-Mare's world famous Grand Pier. 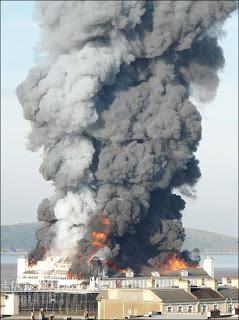 The historic Grand Pier, today consumed by a raging inferno, was originally constructed in 1904 and had just undergone a multi-million pound refurbishment which the landmark event was planned to celebrate. “You tell me that wasn't spectacular! Look at the result, everyone knows that pier really is well and truly finished now,” explained Billingsworth. Kenneth Billingsworth, 58, was only recently hired by North Somerset council in an outreach programme to encourage older members of society with many years of experience to rejoin the workforce, and it is a policy that the local mayor thinks may have to be re-evaluated. Mr Billingsworth, who previously went by the professional nickname of 'Kindling' due to his role in starting fires, echoed that the first placements by the programme may have some teething troubles. When asked if the worldwide attention and the likelihood of serving a further five years in prison as a result of today's events, had deterred Mr Billingsworth from resuming his career, 'Kindling' was undaunted.